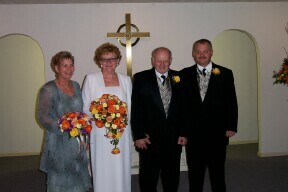 Beverly O'Donnell Walgus (sister of Richie O'Donnell, Muggs Bass and Carol Bunting) was married on Saturday, October 12, 2002 to Gary Cantwell of Lakeview, Michigan. Gary owns the local hardware store in Lakeview and Beverly just retired from the Lakeview School System. They will build a home next year for them to spend the summers on Beaver Island on the O'Donnell compound. Lisa Sladek and Theresa Dennis escorted the 200+ guests into the church where Beverly was escorted down the isle by her son Master Sergeant Steve Walgus. Beverly's Matron of Honor was Diane Jones, longtime friend of the bride. 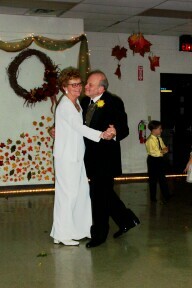 The Best Man was Gary's son-in-law, Andy Sova. 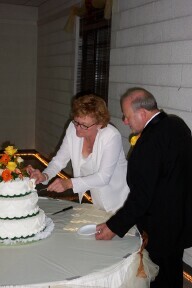 A reception was held at the Curtis Community Building in Edmore, Michigan. The band they had was by the Island's best consisting of Rich Scripps, his brother Mike, Edward Palmer and Danny Gillespie accompanied by Glen McDonough on the fiddle and a few songs sung by Hillary Palmer. Fun was had by all! The couple honeymooned in the UP. On October 22nd, the Islanders beat Grand Marais by a score of 10 to 2 in a District game here on the island. October 24th will see the Islanders heading to Mackinac Island for the Final District game. Good luck, Islanders! UPDATE: The Islanders lost to Mackinac Island 7-1. We're still proud of you, Islanders and know that you played your best. There's always next year.